SESTANOVICH: Good. Let’s get started. I want to welcome everyone. I’m Steve Sestanovich. I’m a senior fellow here at the Council. Our discussion this evening is titled Putin’s Playbook. Our friend, the president of Russia, continues to make news that’s worth talking about at events like this. And we have a terrific panel ready too for that discussion. I should say this is a—this discussion is on the record. And you should turn off all of your devices so as not to drive the electronics crazy. Our panelists this evening are: Alexander Cooley, who’s the direction of the Harriman Institute at Columbia. Angela Stent who is professor at Georgetown and has a new book, Putin’s World, that is, by chance, on sale. (Laughter.) For those of you who have not yet done so, you’ll have another chance to do so at the end of our discussion. And Josh Tucker, who is Alex Cooley downtown at NYU. And I should say that the three of us had a conversation about what we should discuss. And we agreed that it would take about three hours to go through all of the topics that we wanted to cover. And our solution to this problem is I’m just going to bring us up to date with a lot of quick—from some quick breaststrokes about the characterizations that one hears, most commonly about Russian foreign policy over the past five years. We’re now five years into the really significant downturn in Russian-Western relations after the Ukraine crisis of 2014. And in that time, we have heard constantly that Russia is back as a great power, that they’re after a sphere of influence, they’re active globally not just regionally—take that, Barack Obama. That they are more actively pursuing measures that are called hybrid war, that is the full menu of aggressive instruments reflecting the modern—reflecting modern technology, that Putin is bent on restoring this—Russia’s great power status as a way of fortifying his domestic position. But more broadly, he’s comfortable with a kind of political isolation. He thumbs his nose at political correctness, and so on and so forth. That, bottom line, Putin is after respect, if not admiration, and that has been his project. And in some ways, he has been working at that especially intensively in the past five years. OK. We’re now up to date. (Laughter.) I am going to then—we are then going to focus on three topics that I’m going to put to our panelists. The first, about the successes and failures, the record of this more activist policy, more challenging policy. Secondly, how the West should response, how to take into account what in some ways seems like a new set of playbook instruments. And finally, we’re going to look ahead to the succession. So, you know, stay with us. You’re going to know the answer by the end of our—by the end of our meeting. So let me begin with the—if I could, panelists—with the question about successes and failures. Where has the Putin playbook worked the best? Where has it been—where has it fallen short? Where do you think Putin’s own estimate of these—of this record might differ from that of Western government, or from your own. Where has he seemed not sure about how to make choices? Where is he indecisive, undecided? I leave it to you to figure out which—whether you want to emphasize successes, or failures, or works in progress. But let’s start with the record. And, Angela, why don’t you start us off. STENT: OK. Well, thank you. Delighted to be here. So I would say one of the Putin successes really is Russia’s return to the Middle East, as almost the real power broker there now, or at least the honest broker—seen as such by many countries in the region. Because of the U.S. prevarication, because we weren’t sure what we wanted to do there, because of the situation in Syria, Russia now is the only major power that talks to Iran and all the Shia groups, to all of the Sunni states, and to Israel. Indeed, Russia now has good partnerships, new partnerships really, with two of the U.S.’s allies—Saudi Arabia and Israel—for different reasons, but the same reason is because they believe that Russian can restrain Iran Which is something one could quibble about, but Russia is definitely seen as the only power there that will talk to all parties. It’s pragmatic. It doesn’t have any ideological biases. And that’s something I think we wouldn’t have really thought would have happened five or six years ago. STENT: Well, I mean, you can say that the relationship with the United States and the European Union is a failure, in as much as there’s sanctions, and more sanctions, and more sanctions. And that is the Russians thought that by interfering in the 2016 election they would get an American president who would make a deal with them, who would recognize a sphere of influence in Ukraine, who would lift sanctions, then they must be solely disappointed. On the other hand, they have played into the polarization of societies in Europe and the U.S., and that probably is a sort of source of satisfaction to them. COOLEY: So, I would say the number-one success is to get more of the world thinking about the world as they wanted it to be, which is this transition from American hegemony into the multipolar world or, as they like to call it, the polycentric world, right? So if you go back five years—and, I agree, five years is the right baseline—when we looked at the Ukraine crisis we thought this was a cut-and-dry case of one country infringing on the sovereignty of another. Annexing parts, supporting rebels in the other, you know, going against previous sort of international treaties that guaranteed territorial integrity and sovereignty. It seemed pretty clear. For the Russians, Ukraine was almost everything else except Ukraine. It was about this long litany of grievances. It was about Kosovo. It was about NATO expansion. It was about who gets to make the rules. It was about who gets to speak on the world stage. And in some ways, that was a sort of a cathartic release. In the meantime, we see more of the world talking about, is this the end of the liberal international order? If so, where are we transitioning? Who is going to set the terms of global governance now? And in that spirit, I think they’ve done it pretty effectively and on the cheap, right? Things like Syria, where now they’re an effective player but also mediator. Being on the world stage in terms of creating some of these new regional international fora. And I think the biggest success is the relationship with China, which also offers some perils, but you see trade this year is $107 billion. It’s the most it’s ever been. You see cooperation on the security front, the resumption of weapon sales, and you see a real closeness to Chinese and Russian ties about what to do against the West, and Western norms, and Western governance. SESTANOVICH: Alex, you’ve written a lot about Russian policy toward the post-Soviet states. But you didn’t mention the sphere of influence. How would you rate that, and the record there? SESTANOVICH: (Laughs.) The all-important Kyrgyz Republic. COOLEY: You know, all-important Kyrgyz Republic, which is effectively now a Russian client, what we see happening now in Uzbekistan is very exciting in terms of Central Asia and openness. And you see real regional connectivity. So Uzbekistan becoming a hub link to Tajikistan and its neighbors, but it’s all about Russia. So the whole idea of regional integration from the Russian perspective was that Moscow would mediate regional integration, and regional cooperation. That is not happening. You’re getting a lot of dynamics from the bottom up that they’re not necessarily involved with. Plus, you’re seeing China now increasingly encroaching in that sphere. So we saw a Washington Post expose about a Chinese base in Tajikistan, which used to be sort of a red line as far as the Russians were concerned, as well as the encroachment of the Belt and Road in this sphere of traditional economic influence. SESTANOVICH: I think you’d have to treat that as a pretty significant shortfall, given the way in which, for the Russians, for the past 10 years, talking about a sphere has been central to their foreign policy conceptions. COOLEY: Absolutely. But also the goalposts have moved, right? And so you hear in this the rhetoric of Putin. Over the last two years we’ve gone from sphere of influence to a greater Eurasia, right? Russia will be at the center of a greater Eurasia. And because we happen to be in the center, Chinese-led economic integration is therefore in Russia’s interest, right? The expansion of the Shanghai Cooperation Organization to include India and Pakistan is in Russia’s interest. But in a way, it’s just scaling up to admit that you actually haven’t been able to create the wall of protected space. SESTANOVICH: Josh, pros and cons in the record. TUCKER: Well, so I’m going to go—I’ll go and provocatively say sort of the two biggest events, at least from the perspective of the vantage point that I take with this—have to be what happened in Crimea, what happened with Ukraine, and the rise of this kind of asymmetric warfare being extended into the disinformation sphere. And the interesting thing about this is I think you can conceptualize both of these things as pros and cons, right? So you can—or successes and failures, as you said, right? So on Crimea, you know, this is a long-held goal for lots of people in Russia. Enormously popular. It leads to Putin, you know, sky-high approval ratings for year. In fact, for those of us who study public opinion, this became kind of a puzzle, right? We’ve seen rally around the flag effects in the West, but they tend to dissipate after six months, right? Just ask President George W. H. Bush about his second term, right? These things go away. But with Putin, it lasted, you know, much longer than we had expected, and in a very kind of genuine way. And then when we look, again, at this question of the rise of the sort of disinformation sphere, and this ability to use multiple levers to try to interfere in the domestic politics of NATO, of EU member countries, of countries that you would have thought perhaps Russia would not want to, or be capable of, really interfering in domestic politics. And this gives an aura of sort of Russia’s back, and Russia has this sort of strong power and is this force to be reckoned with. However, at the same time, I think both of these things can be thought of as major failures, because if you look back and we take the vantage point—and I think this is a great time to be thinking about this, five years out—if you think of what was going on in Russia before the annexation of Crimea, right, Russia was hosting the Sochi Olympics. Russia was in the G-8. Russia was, you know, right about to take its sort of rightful place in the sort of big, you know, collection of big powers in the world, and sort of be part of this Western world in a way—you know. And not really in the West, and I don’t want to overstate this by any stretch of the imagination. But then you fast-forward after Ukraine, what do you get out of this? You get sanctions. You get the breakdown of it. You get the beginning of this kind of diplomatic isolation of Russia. If you said to the Russians in 2014, five years from now, Europe will be complete unified in keeping Russia isolated, you know, would they have taken that deal over Crimea? Maybe? I don’t know, right? Bogged down in a conflict with is costing them a lot of money, right, and has all these sort of potential blowbacks for Russian domestic politics if it doesn’t go right? You know, in south and eastern Ukraine, you know, five years out still that this would be, you know, another one of these sort of frozen conflicts? I don’t know. Then you go onto the sort of disinformation sphere, right? Everyone looks at the 2016 elections—and this is where, you know, my lab does a lot of work in this area. But everyone looks at the 2016 elections. It gets pointed as, again, this is this, you know, great success for Russia that it’s able to meddle, it’s able to have an—you know, it potentially have an impact in influencing the outcome of the 2016 U.S. elections—which is, of course, far from certain. But look at it this way, right? If Trump was going to win that election anyway, what a world are we in right now? We’re a in a world where Russia got caught meddling in the U.S. elections. They got perhaps the friendliest U.S. president Russia’s going to see for quite some time now, right? And what did they get as a result of that? The only thing the Democrats and Republicans would agree on in a bipartisan fashion in the first two years of Republican control to roll President Trump on was ramping up the sanctions against the Russians, right? And I was at conferences with a lot of people who were sort of in the know about what was going on in Russia in January 2017. We were talking at that point in time about the sanctions being lifted, like, within the first week of the new administration. We are so far from that point at this point in time. So I think we have to consider, you know, there are a lot of advantages to Russia from Trump having become president. If—and this is an enormous if—if that influence operation actually led to Trump becoming president, well, we could talk more about the implications of that, but in some ways you could say there’s benefit for them. But if it didn’t, if they would have gotten Trump otherwise, and a Trump who was ready to take the sanctions off, and would have probably taken the sanctions off if the Russians hadn’t got caught with their, you know, hand in the cookie jar—so you have to look—you know, what would that world look like? So you have to, I think, conceptualize this as a potential major failure too, because those sanctions don’t seem to be going anywhere at all at this point in time. SESTANOVICH: Let’s turn to implications for Western policy. I mean, you’ve got a different mix of successes and failures, the three of you, but I think you generally think there is a mixed record. What’s the implication for the West of your assessment or the assessment that you think is generally shared? If people read Russia the way they do, what’s the—what’s the way in which we—where have we had the most difficulty responding to the challenge? Where have we not seen ways to—that are available to respond to it? And I don’t mean this just in operational terms. Are there conceptual ways that we need to think differently about where—what Russia represents? And so as to be more—Western governments can be more successful in responding to this? I’ll start with you, Angela, again. STENT: Yeah. I mean, so far I think we’ve had a very reactive policy. I mean, you know, suddenly we realized the Russians were interfering in our elections. The Europeans realized the same thing. We’ve been catching up. We’ve been trying to, you know, develop better defenses against this—both the social media, both in the cyberspace. I think you can really ask what is it that the West wants from Russia. What is U.S. policy towards Russia? I mean, as you said, it’s sanctions. It’s the next wave of sanctions, then the next wave of sanctions. That might not be what the president wants. It’s what the Congress wants. And then we seem to have an administration that’s not interested in continuing arms control, or really any of the traditional channels of U.S.-Russian interaction. STENT: Well, I mean, I do think that this issue—again, it’s not very exciting and it’s not very new—but strategic stability. I mean, this is something where, for all the decades of the Cold War and the post-Cold War, we’ve recognized that we have, you know, certain interests in common, you know, that we have to preserve, and responsibilities. We’ve sort of let that atrophy. So you have to pick up some of the traditional pieces if you want to move on and do some, you know, more. And I think ultimately—and I know that’s not very popular now—there has to be some kind of dialogue about these cyber issues, about the kinds of things that you follow in your labs, because you can’t just put your head and in the sand and say: Well, we can’t talk to them, because this is what they’ve been doing. SESTANOVICH: The main adjustment, practical and conceptual. COOLEY: Well, I mean, conceptually we need to sort of figure out what we want out of the foreign policy too. Are we happy to go along in a direction of being the world’s leader, hegemon, along transatlantic partnerships and values? Do we want to resurrect those, to shore those up? Or are we looking at a world where it’s going to be a G-2 world—us and a China that has already risen—and that we’re going to start in this competition for carving up the world in terms of the world order and different international organizations and different spheres. And in part, Russia policy has to follow that, right, because if it is the case that we’re looking at a G-2 world, then I think, you know, the potential for being more pragmatic with Russia is there. And it’s actually imperative. SESTANOVICH: You mean try to draw the Russians away from the Chinese? COOLEY: Well, that’s going to be impossible, right? I think that’s a fool’s errand. But certainly not to double down on Russia being the main antagonist in terms of our own kind of foreign policy view. So part of that depends on in our own foreign policy what do we want, you know ,this next era to be. The other issue I think that’s coming up are domestic political constraints here in the U.S. I would say at this time Russia isn’t just a diversion. Russia is actually a domestic political factor, right? Russia is toxic. And this matters in terms of trying to be more pragmatic. We’ve had two instances now following Trump-Putin summits where, you know, the fruits were the establishment of some working groups, very pragmatically, on areas where we could explore cooperation. In both cases, they were outed in the public sphere. Even Republicans ran away from them in saying, you know, cyber—we’re not going to have a dialogue on cyber after what’s just happened. So there’s a real limit to what we can do domestically. And, you know, in some ways we need some closure on acknowledging what happened before we can move forward. Plus, we are now getting into election season where we will have Russia as an issue be alive and well, especially in the Democratic primary. So I’m not even sure the time is right to be able to pursue that pragmatic cooperation. But I think the larger conversation is what our own foreign policy should be. SESTANOVICH: So our message to the Russians is: We’ll get back to you. COOLEY: Kind of. Yeah. (Laughter.) Or at least we won’t make it worse. SESTANOVICH: Yeah. Josh, your success and failure assessment, highlighted a sphere of influence, that is relations with Ukraine, and asymmetric warfare, two of the most controversial areas of Russian policy. Would you put those at the center of an attempt to try to reconceptualize or redirect, revive a Russian-American dialogue? TUCKER: Yeah. And I agree with Alex that until we get past what happened in the 2016 election, all the other things we talk about, sort of resetting these things from the American standpoint, is going to be very difficult politically. The problem is, and you’re—the original question was about, like, the fundamental challenges that Russia is facing—is that what Russia, and not only Russia, but Russia is sort at the vanguard of this, was able to do in 2016 was essentially figure out a way to weaponize the very openness of Western societies, right? And so we have a situation here whereby Russia engaged in a strategy of injecting information in to American domestic politics but doing it in a way that took advantage of the fact that we have tolerance of free speech, that we have these institutions that are designed to allow people to communicate. And what makes it even much more complicated is that you have these vectors by which information can be inserted which are, admittedly, American, but are essentially huge multinational corporations, right? So it’s not like the U.S. government can just wake up tomorrow and say, oh, Facebook, do X. It would be a long, drawn-out process in order to do that. And there are very exciting kind of interesting stirrings of sort of public-private cooperation between the platforms and between people in Washington. But I do think there is a fundamental paradox and a fundamental tension here. And as a society, one of the things we have to figure out to do—we have to figure out is exactly how much we’re willing to walk back on sort of core values that make sort of this transatlantic alliance what we want, in order to deal with what we see as a threat in this kind of asymmetric information-centered warfare. And for us as a scholarly community, I think it’s very incumbent upon us to try to figure out just exactly what the impact of these events are, as a—as a kind of—as a security private industry kind of nexus, I think it’s incumbent to sort of figure out what steps can be taken in these kind of technological spheres, in the sort of cooperation spheres, to mitigate these kinds of threats. And I think it’s going to kick back, as well, to diplomacy, which is one of the things. Because if we don’t do this, we’re facing very difficult tradeoffs, I think, that get to the essence of what makes us free and open societies. TUCKER: One of the lasting legacies of this is not so much Russia for Russia’s sake—because I’m sure Russia will continue to do this—but it was exposing a toolkit and a set of—a set of strategies and tactics that can be used both by other foreign actors, but also by domestic actors as well. So it’s a very complex issue. SESTANOVICH: I promised the audience that we would tell the answer to the Putin succession conundrum. (Laughter.) And in the five minutes we have before we’re going to open to questions from the audience, I want you to go out on a limb here and tell me how you see this playing out. It’s certainly this—the question that people in Russia talk about all the time. There’s a kind of obsession with it. And I want to hear your take on it. Angela, you in your book say—you kind of downplay the idea that this is Putin’s policy. It’s Russia’s policy. Which I would interpret to mean you don’t expect a succession to produce any kind of foreign policy change. SESTANOVICH: I keep recommending The Death of Stalin to everybody who wants to—best movie of last year. STENT: Stalin, right, right. So let’s assume—let’s assume that he does at some point leave office. So, you know, he’s the most powerful man in Russia, but he’s not all powerful. And not everything that’s happening is just because of him. The ideas and the policies that he has pursued are shared at least by the elite and the people, you know, who rule with him. So let’s say he’s no longer there. Let’s say he picks a successor. And we don’t know that. I mean, in Russian history there are just a few means of succession. You know, death by natural or unnatural causes or, you know, dynastic under the czars, or palace coup, or we had the Yeltsin to Putin model there, where you picked a successor. So he would probably pick someone who he thought would pursue the same policies as he would. You know, the real dilemma for the successor is going to be: Do you choose economic reform, which could be destabilizing? Or if you don’t choose it, and you choose this kind of stagnation and the status quo, Russia becomes less and less modern as China and all of the other Asian countries, and countries surrounding Russia, become more modern. And that would argue, of course, for a less-hostile policy toward the West, if you really want to modernize the economy, be fully integrated in the global economy. So, you know, one would hope that that would happen, but you can’t guarantee that. SESTANOVICH: Alex, is there a domestic constituency for de-Putinization? And how would it play out? COOLEY: Well, I love your term, de-Putinization. (Laughter.) But I’m with Angela on this. I just don’t see structurally what would change. Yes, you might get someone who perhaps is less inflammatory in the rhetoric, you know, perhaps is willing to be more truly multipolar—in that you’re willing to deal with all the poles, right, not sort of just the pivot to the east. But some of the structural issues aren’t going to change, right? No Russian leader is going to accept things like NATO expansion. What are—you know, is there ever going to be a concession on, say, Crimea and its status to roll back those sanctions? That’s hard to imagine. Are you going to be more openly and publicly critical of the Chinese relationship? Very difficult, since you’re really good friends now and you understand each other. So I don’t know. I think, yes, in terms of style, maybe it would be a little less rough. But I think the basic parameters of moving to this world where Russia is a great power, where it acts in its own interest and it acts in this sort of pragmatic way with different post-Western constituents—that, to me—those are the parameters for any regime coming out. SESTANOVICH: Josh, you’re in this panel the domestic expert, really, more than the rest of us. Putinism, as far as the eye can see? Is that—is that your take? There is a—there’s certain a group of people around Putin who are telling him: Deemphasize foreign policy. Talk about your determination to improve conditions at home for the average Russian. Does that mean anything? TUCKER: Well, that’s what I want to pull back to, is the public opinion thing. Like, I think—you know, my take on this is that Putin did build up a tremendous reservoir of support among Russian citizens that’s largely genuine for what he was able to do in the kind of post-Yeltsin era. Putin’s successor, if there’s a Putin successor, I guess when there’s a Putin successor. There will be at some point. But Putin’s successor will not have that reservoir of goodwill to draw upon. And as I said, it was puzzling how long that post-Crimea bounce lasted. It’s not lasting anymore, right? Now, he’s still got 65 percent approval ratings, which any Western leader would be thrilled to have. SESTANOVICH: But only low-30s of trust. TUCKER: Well, that—and this is what those us who study Russian public opinion have long debated, which is what do you make of a public opinion rating in a president when there’s no alternative? And when you look at confidence in the government, when you look at confidence in ministers, when you look at confidence in other things, they’re all lower than confidence in Putin. And a lot has gone into investing into the sort of—the Putin persona. And so the question is: If he steps down in, whatever it is, five years now, and we have five more years of economic stagnation between now and then, and he gets a successor, will that successor have this kind of reservoir to draw upon? And if not, what will the successor think is necessary to do at that point? I mean, I don’t—I don’t want to make too much of the analogy, but, again, you had a charismatic leader in Chavez in Venezuela. You have a less-charismatic leader in Maduro, who’s had to bear some of the economic costs afterwards. Russia is not Venezuela. The economy is a hundred times different. But, again, I think after having—if he really does kind of exit the scene, this next leader will have more pressure and will be more susceptible to what is generally a strong relationship between economic conditions and public opinion, and if those economic conditions haven’t gotten better I think there will be pressure on the new leader to think about how to improve the economy, which may have ramifications in the foreign policy realm. SESTANOVICH: All right. This is a very vivid image. The Maduro phase of—(laughter)—Putin—of Putinism. OK. We are now going to turn to the audience for your questions and just put up your—reminder, we’re on the record—put up your hands. Brief, concise, to-the-point questions, please. Yeah, over here on the aisle. Q: Thank you, and thank you for the presentation. John Sakowicz, host and producer of Heroes and Patriots on many public radio stations on the West Coast. This morning we interviewed Hedrick Smith who, of course, won a Pulitzer Prize for his reporting as New York Times bureau chief in Moscow, and hope you will autograph a book for him. And on Monday we’re having dinner with General Wesley Clark, who was our NATO commander, and we’ll buy a second book and hope he’ll autograph the book. SESTANOVICH: —because I want to give as many people a chance to ask questions as possible. Q: Thank you. About the collapse of the INF Treaty—United States and Russia control 90 percent of the world’s nuclear arsenal. What does the collapse of that treaty and the fact that the United States and Russia will no longer be constrained by nuclear arms treaties mean for the proliferation of nuclear weapons in other nation states? STENT: I mean, I think it has very serious ramifications and I think what’s even more worrying is the fact that the new START treaty expires in 2021 that controls strategic nuclear weapons, and that could rather easily be prolonged for five years and I don’t see very much interest in our administration in prolonging that. And so we could be in a situation in 2021 when we have no agreements that cover U.S.-Russian nuclear arms, the first time since 1972. Now, one of the problems is China. I mean, one of the issues with the INF Treaty is the Chinese, of course, have been building up their intermediate-range nuclear weapons and have not been bound by a treaty. Both the United States and Russia would like China, in a future agreement, to be involved. The Chinese, of course, don’t want to hear about it. But so I think that’s a serious issue but I do think that we are moving towards a situation which is much more unpredictable and would encourage proliferation, and we’ve just seen with India and Pakistan, you know, a limited war there. But something like that could easily flare up between other countries that might acquire nuclear weapons. SESTANOVICH: Do you guys want to add anything? Q: Thank you. Peter Clement, Columbia University. My question is about succession. 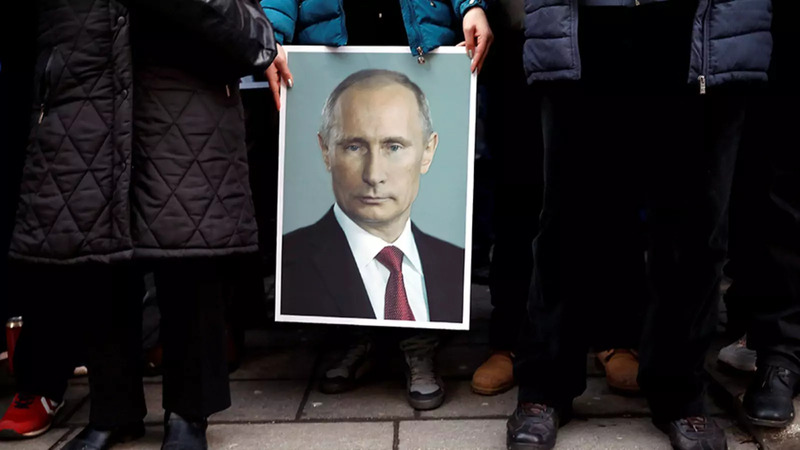 So we spoke with a visiting Russian academic this week and I asked her has Putin made himself indispensable, which implicitly would suggest he isn’t going to step down. STENT: (Laughter.) You want to take that one? TUCKER: Yeah. So I think we need—I mean, we’ve got a bunch of years before this happens is the first point. The second point is one of the more puzzling aspects about Putin the first time around Putin won was that he did step down and that he did seem—you know, he could have changed the constitution at that point in time, and yet, he was taken, I think, by the legalism of it and maybe he wanted to get out at that point in time, right. There’s a story to be told about Putin wanting to become Tony Blair and getting out of the day-to-day business of governing, and then he gets sucked back in because of various reasons and he can’t do this, and maybe that’s completely wrong. But the only observable—you know, the only data point we have on this is that he chose to respect the constitution and step down and when he came back to power he did not amend the constitution to get rid of term limits. They amended the constitution to lengthen the term of the president. So, I mean, would I bet a lot of money on the fact that they wouldn’t change it as it got closer—that there wouldn’t be an emergency—there wouldn’t be a thing? Of course not. But the one time we saw him he adhered to this. SESTANOVICH: But this is not an answer to the question of indispensability and I want to press you a little bit on this. Is what Putin adds—the secret sauce, the value added—so crucial that it’s hard to imagine somebody else doing it? It is said by Russians that Putin felt Medvedev had not actually been able to make the system work. What kind of stock do you put in that? SESTANOVICH: It is said that he’s watched that video many times. STENT: I don’t think anyone is indispensable. Putin is not indispensable. I mean, that’s the whole point. If he goes, it’s not—nothing’s going to collapse. I mean, the system would continue. SESTANOVICH: Medvedev will become president. SESTANOVICH: What do you mean? It’s the constitutional requirement. STENT: (Laughter.) But, you know, he’s not indispensable. COOLEY: I think one of the things that you’re seeing also with the sanctions and the pressure points and what happened in the recent Deripaska episode is that if the theory of change here is that you put pressure on these individual oligarchs near Putin to say, you know what, enough. This is gone. It’s hurt us too much. We need a change, and so forth, and they somehow behind the scenes, you know, manage to stage this, that’s not happening. What’s happening is the opposite—that we’re driving these different major economic actors into the arms of the Russian state, right. More of their assets are being appropriated by the Russian state and in some ways having the opposite effect of what the theory of change in sanctioning the oligarchs is supposed to be. Q: John Hirsch at IPI. What do you all think should be the major focus of American foreign policy in the next two years leading up to the 2020 election year vis-à-vis Russia? STENT: Well, I mean, I think we should—you know, we should find some way to reengage on some of these very important issues with the Russians and I think we should stop piling on the sanctions. I agree completely with Alex that they’re completely—that the sanctions against individuals are completely counterproductive. They’ve driven these different oligarchs closer to Putin and we’re now imposing sanctions that have serious implications for our allies. You know, we’ve done it before but it’s not a very good idea. So I think just maybe stopping with the sanctions and finding some better way of talking to the Russians on some of these very difficult issues, that should be the focus. But, as was said, Russia is such a toxic subject domestically and for opponents of President Trump, Russia and Trump are synonymous. So that’s probably not going to happen. SESTANOVICH: Do you guys want to add anything to this? TUCKER: Very quickly. I think the United States has—that the longer-term success of relations with Russia is having Russia not seen as someone—as a power that has the ability to manipulate U.S. elections and I think the most important thing to do is to try to secure the integrity of the 2020 election process, especially if we expect another close election afterwards. SESTANOVICH: Yeah, way in the back. Q: Bhakti Mirchandani. I work for a think tank called FCLT Global. This has been a really interesting discussion. Putin is very popular in Russia. He seems to have won the hearts and minds of his people. As you point out, there’s no alternative. In the United States, Russian interference has reduced confidence in our democracy for a lot of the population. So can you help us put this into historical context? If you think about kind of other times in history, how is our ability to influence Russians’ perception of Putin versus Russia’s ability to influence our perception of our democracy and how good or bad is it if you take kind of a historical perspective? How concerned should we be? TUCKER: Well, it’s interesting that you ask the question in an asymmetric manner, right. It’s not about their ability to influence our perceptions of Trump and our ability to influence their perceptions of Putin, right. I think, ultimately the domestic—the popularity of a domestic leader is going to be a function of what is happening in that country. Putin has been popular in that country because he’s delivered goods to large portions of the population and because we don’t really actually know, you know, how popular he is. But he’s popular enough, right, in his country. In terms of questions about have we had other times and period where—times where foreign actors have led us, you know, to have less faith and the confidence of American institutions, I mean, we had a civil war in this country so things got a lot worse than they are right now. I think we want to be—I want to—I mean, I want to rectify the thing that I said previously, which is that I think the number-one thing we can do to sort of long term get this relationship in a better direction is to do whatever we can to prevent foreign interference in the 2020 elections, especially the integrity of ballot machines and all these sorts of things. But at the same time, I think we don’t want to overstate the extent to which confidence in U.S. institutions—excuse me—in which confidence in U.S. institutions is being driven by actions of the Russians in 2016. There’s an awful lot of domestic factors that are at play right here. There’s many things happening at the same time. Certainly, a piece of this may have been—may have been, you know, a response to what happened with Russia. But we recently released a report—it’s called the 2018 U.S. Institutional Confidence Report. I worked with people at the Baker Center at Georgetown about this. What is stunning about what we found is that, for the most part, so much confidence in U.S. institutions is driven by partisanship these days, right. Democrats don’t like the executive. Republicans don’t like the FBI, right. The only thing everyone agreed on was everybody liked Amazon, right, and didn’t like Facebook, right. But, otherwise, the press Republicans didn’t like, and some of these things are just flipping. So I would be careful about over—you know, there are domestic trends that work here that have to do with the rise of effective polarization in the United States that I think are probably much, much stronger influences on the decline in confidence of institutions than Russian actions in 2016. COOLEY: I would say, you know, at some point, though, there is going to have to be a dialogue about cyber. I don’t—as Steve says, you know, the time is not right now and I think it would be counterproductive. But when we do have it we need to find new red lines, frankly, and so, you know, in a very sort of forthright manner what’s in and out of bounds, right. The sort of—you know, the RA trolls that you’ve studied, you know, in your lab is, you know, is that permissible because this is a social media type of platform? This is vulnerability where sort of hacking is absolutely not permissible? That could be one way to cut it. But there has to be some sort of attempt to figure out these lines in the sand, going forward. SESTANOVICH: Well, the question was also about whether there’s anything that other countries do that shapes the way people view Putin, and is your answer to that really no? COOLEY: I mean, here’s the paradox for me, right. So and I had a piece in Foreign Affairs with Dan Nexon on this a couple of years ago right after Syria. There’s this sense that Putin is admired because he’s very decisive. He decides one day, we’re going to Ukraine. We’re going to go into Syria, right. I am the decision-maker and it’s going to happen and you, in the U.S., you dither and you consult and you do this. But, in part, that’s a function of the position of strategic weakness that Russia is in, right. Russia doesn’t have allies. It doesn’t have this set of global commitments and obligations which makes a U.S. leader have to do the rounds, right, and see how this is going to impact country X, country Y, country Z. But, from the outside, there seems to be this temptation that this decisiveness makes Russia and Putin strong, right. But the paradox is it’s borne out of a geopolitical position where there is just not a lot of consulting to be done. SESTANOVICH: Every Russian that I know says Putin is indecisive. (Laughter.) Every Russian I know who knows Putin. COOLEY: Right. Right. Fair enough. STENT: —because we’re now in a situation where we don’t quite do that anymore. In the 19th century you had the great rivalry between the British Empire and Russia over India and Afghanistan. The second version now is in Central Asia between Russia and China. How do they resolve that? COOLEY: They’re not going to resolve it because it’s in both their interests to say, there is no rivalry. You in the West are obsessed with saying that there’s a rivalry. There’s no rivalry. We have it all figured out, right. Russia does the politics and security. China does the economics. We have a perfect division of labor. Of course, in practice, the very fact that China does so much economically necessitates legal arrangements, governance in which they do start playing a political role, on the one hand. And on the other hand, as we’ve seen with the suicide bombing in—against the Chinese embassy in Bishkek, Kyrgyzstan in 2016, which prompted a serious investigation and action on behalf of the Chinese, you see this now in terms of Xinjiang and the reeducation camps where you have a hundred thousand Kazakhs who have passed through those, and that is now a big bilateral issue with the Kazakhs. So this security versus economics distinction it breaks down a little bit. However, it’s in neither side’s interest to say that we’re rivals and that we’re competing, right, precisely because the public face is, you know, we’re cooperating, right. What we don’t want is we don’t want Western influence, we don’t want color revolutions, we don’t want sudden regime changes and instability, and we certainly don’t want street protests in this joint neighborhood. SESTANOVICH: In that same spirit, I will say that a Chinese official told me a couple years back—maybe about the same time as the conference you’re describing—the Russians greatly exaggerate their significance in international affairs. Q: Rob Person, U.S. Military Academy at West Point. Many in the American military establishment and, in particular, the Army seem to be very concerned about the possibility of a direct military threat to the Baltics and by this I mean actual military action, be it covert or overt, and not simply the sort of political informational warfare. I tend to be a skeptic of that proposition but would be curious in your take on it. STENT: I mean, I think the Russians are quite glad that, A, the Baltics feel that this could happen—that they’re very worried about it and that other, you know, countries are worried about it, too. I think the Russians have accepted reluctantly that the Baltic States are part of the West, that they’re in NATO—they’re in the European Union. The Russians will hassle them. They’ll use cyber and all of these other things short of outright military attack. But I think they do understand even though they’ve forced NATO to discuss whether the Baltic States really are defensible, and in 2004 when they joined NATO people didn’t think about that enough, even though the Russians have created all this uncertainty, I really don’t see that as really—as a real possibility that there would be a military attack. STENT: Deployment. Right. Deployment. Exactly. COOLEY: Right. And a possible presence in Poland, too. SESTANOVICH: —takes account of it. Q: Hi. I’m Denise Fletcher. I have a—yeah. Thank you. I have a question with regard to—in the context of your success and failure that you started off with. In that context, could you please talk about what’s going on between Russia and Turkey and Mr. Erdogan’s—you talked about the Sunni powers. You forgot to mention Turkey, and I’d be very curious to know what your thoughts are. STENT: Well, I sort of included Turkey in that. I mean, it’s a very complicated relationship, right. It has its ups and downs. You know, after the Turks shot down a Russian plane it was very bad. Now it’s on again. I mean, I think President Putin has understood, you know, President Erdogan’s sensitivities about the U.S., his belief that the coup—the attempted coup—came from Mr. Gülen here. And so in every way the Russians have backed, I think, the narrative by President Erdogan and, clearly, they’re selling Turkey advanced weaponry, although Turkey is a member of NATO. We have debates in this country about, you know, how long will Turkey remain in NATO, although it probably will. So I see that, you know, at the moment as a fairly robust relationship not without its strains and they—and, you know, Russia has managed to bring the Turks along to sit with the Iranians and discuss, you know, the future of the peace in Syria and what Syria is going to look like. And then I think you do have to give Putin some credit for that because, obviously, Turkey and Iran were arrayed on completely different sides. That doesn’t mean that they couldn’t have another falling out. But right now, that relationship seems to be working quite well. Going back to cyber, in this room we had a meeting on cyber not to be quoted outside the room, so I can quote them in the room. SESTANOVICH: This is on the record so be—respect that. Q: Yeah. And we had some friends in uniform as well as outside who work on this question, and it was informative. And the conclusion was that there is no defense against cyber—that if you are an offender you are always ahead. You can then catch up against that, but—(inaudible). TUCKER: I mean, the point that I’ll take a little—I mean, I think—so yes, I agree that this is the long-term solution is some sort of an international agreement and I think that the more people look at this the more they think that that’s where we’re going, and the reason is, though—the one thing I’ll push back on is to say, well, there’s not any defense. I would describe it differently. I would say that in this kind of cyber and information realm what you always have is a cat-and-mouse game. You have one group developing one tool, one group responding to that tool, another group responding. And so I think this has the potential to escalate. It has the potential to move sideways. It can move into—we haven’t even talked about new forms of disinformation as it migrates from text into images and then into video and deep fakes and these kinds of things. So I think that—I wouldn’t—I wouldn’t describe it as that there’s no defense. I would just describe it as that it’s cat-and-mouse or whack-a-mole. You know, it’s going to take—whenever you have one—have a handle on one thing something else is going to pop up. So I do think—I mean, I’m not an international relations expert by any stretch of the imagination but I have been—our colleague, Kimberly Marten at Barnard College, has been pushing this idea of you really need to kind of get an agreement on this and I think that that would be an enormously valuable step forward. Now, enforceability in an era where everything is so decentralized and hard to trace becomes a whole other matter. STENT: It was the—it was the IRA in St. Petersburg. SESTANOVICH: Only on the IRA, not on the—not on the GRU, too, just the IRA—in connection with our elections. TUCKER: So this was supposed to be part of the deterrent against 2018 interference in the elections. TUCKER: —in the news, right. One of the things I think that’s most important here is that when we think about this is that we want to think about what the public has an ability to know about what’s going on here and that means getting data into hands of people who can analyze it, who are outside of simply being in security services or inside of corporations, because until that happens we’re going to continue over and over again having these kind of “trust me” discussions and it’s hard for us to verify what we’re being told if we don’t—if we’re not able to see the data, which is—and it’s been mentioned a couple times how people are looking at the IRA troll data. I want to give props and shout out to Twitter, which actually went and took this data that they first reported to the U.S. Congress when they—you know, who knows why they, you know—they had to report it to Congress and they turned over these accounts. But then they took the tweets of all of those accounts and put them in the public domain so scholars could analyze them and have a public conversation about them, and I think we want to see more of that or we’re going to keep getting questions like this. Q: Lucy Komisar, and I’m a journalist. Precisely on this question—on the issue of meddling in the election, particularly through Facebook, Facebook says that they received $100,000 in ad spending from accounts it says were connected to Russia and there were three thousand ads which they said amplified divisive social and political messages from June 2015 to May 2017, which means the ads ran six months after the election; it said $50,000 in potentially politically-related spending on, roughly, twenty-two hundred ads, though it said most of them didn’t refer to the election, voting, or a candidate. So what was the strategy of these Russians who, apparently, shifted the vote without ever referencing the election or the candidates? What evidence do you have in polls, surveys, statistics to show that people who saw these ads changed their minds about who they would vote for, who benefited, did they cancel each other out? And I also wonder what the campaign people for Hillary, for example, thought, who spent millions of dollars and they, apparently, were not as good as some Russians that spent 50,000 (dollars). TUCKER: So, yeah. Thanks for the question. TUCKER: Yeah. Thank you for the question. I think you’re exactly right on this question, right—a hundred thousand dollars versus the hundreds of millions of dollars that were spent on the election campaign. What evidence do we have that anyone’s vote was changed by this? We have zero evidence that anyone’s vote was changed by this. But we have zero evidence that anyone’s vote wasn’t changed by this. We just don’t have this kind of evidence at this point in time. If you want to see the sort of strongest case that’s being made for the fact that this may have had an impact on the election, we have Kathleen Hall Jamieson who’s just written a book about this and lays out a lot of things in there. That’s a case. If you want to see sort of micro level evidence of have we—do we have a sense of, you know, how much exposure people have, we’re beginning to get a sense of how much people exposure have. The way that we think about this, kind of, if you want to ask questions about, say, fake news or disinformation and what happened in the 2016 elections, I would posit that this is actually four separate questions, right. You want to have questions about who produced information, you want to have questions about who shared that information, you want to know who was exposed to that information, and then you want to know what the effect of that exposure was. We know a lot more now about those first three questions and we know very little, again, in a public academic research community, about the answer to that fourth question right now. However, the election was incredibly close, which means the weather may have determined the outcome of the election. There are a lot of things in a super close election that may have determined the outcome of the election. So, in a sense, it’s an overdetermined situation in this regard. But will we ever have a concrete answer about it? And, finally, you can point to the ad spending. You can also point to things like the hacking of the DNC and the release of the emails and what that did to the news cycle and what that did to the larger conversation around this. It may be that that single act—if that was an act that was done by the Russians under the direction of the Russians—if it was, that that had a much bigger impact than these ads that you’re talking about here. SESTANOVICH: OK. We’ve got time for one really, really quick question that I’m going to recognize you for. Yeah, because you’ve had your hand up. SESTANOVICH: And then we’re going to have really quick answers. Q: Stalin, who still enjoys a certain amount of reverence in parts of the—of Russia, if not in his native Georgia, had at least created political institutions—the Party—that outlived him for half a century. Putin seems to have presided over a deinstitutionalization in Russian politics, eliminating elections for governor and political parties hardly existent. What becomes the basis for organizing in political competition for—when God calls Putin home or if he himself decides that God should—he should leave, as God? (Laughter.) How will those pieces be put together in the absence of real political institutions? STENT: Well, I mean, it’s an excellent question because Russia really hasn’t had any functioning institutions of governance since the Soviet collapse. I mean, Yeltsin began to build them and then under Putin—the institutions don’t matter, and this goes back centuries in Russian history. It’s always the informal arrangements. But at least in the Soviet period you had some institutions and they did—you know, they did make the system function. So this is going to be a huge task for Putin’s successor to create institutions that will make this a better functioning and a better-governed country and not so dependent on these highly personal informal mechanisms. STENT: Oh, please do. Yeah. STENT: —system in a way which is different from the Soviet system. And by the way, to add to what you said, you know, was just the commemoration of Stalin’s death and they had fairly large numbers of people went to where he’s buried in the Kremlin Wall, put flowers there, praised him—mainly Communists—and then when some younger people came and disagreed with them they were hauled away quite violently. So he’s still quite popular—Stalin. SESTANOVICH: He has his followers in Georgia, too—whatever you said. I want to thank our panelists. I want to thank the—(applause)—thank the audience for very wide-ranging questions and I will promise you that we will be back at this subject between now and 2024.